SYRACUSE, NY (WRVO) – Towns and villages across New York State are joining forces to ask the state to restore funding for towns and villages that was mostly eliminated from Gov. Andrew Cuomo’s proposed $176 billion budget. Aid and Incentives for Municipalities (AIM) has been a stalwart revenue stream for towns and villages for years. Losing it leaves big holes in the budgets of central New York governments. The village of Solvay stands to lose $175,000, the town of Cicero will lose $178,000. The Cuomo Administration said the cut to AIM only affects governments in which funding is not a “significant factor” in their budget. The leaders of these municipalities disagree. Town of Clay Supervisor Damian Ulatowski said he’ll have to fill a $416,000 budget gap in the middle of a budget year, forcing difficult choices. 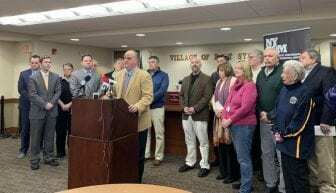 Town and village officials are calling on state lawmakers to negotiate AIM back into the budget. State Senators Rachel May (D-Syracuse) and Bob Antonacci (R-Syracuse) say they’ll fight for that. Even if that happens, these towns and villages suggest a deeper motive from the state. Fayetteville Mayor Mark Olson said Gov. Cuomo is unfairly pinning New York’s distinction as the state with the highest tax burden in the country on towns and villages. “If you listened to the debate he had with Marc Molinaro, the reason taxes are so high in New York State is because of local government. Stop, stop. It’s not genuine, it’s just not true,” Olson said.